Dr. Hillary Frank of Phoenix, AZ was certified as a Diplomate by the American Board of Veterinary Practitioners (ABVP), specializing in Avian Practice in 2004. She again demonstrated current competency and specialist qualifications by recertifying in 2014, as ABVP requires every ten years. The American Board of Veterinary Practitioners (ABVP) is comparable to the American Board of Family Practice (ABFP) specialty in human medicine. It was established in 1978 to recognize excellence in clinical practice through the certification of species-oriented specialists. Veterinarians world-wide are certified in one of ten practice categories: Canine & Feline, Food Animal, Equine, Dairy, Swine Health, Feline, Avian, Small Exotic Mammals, Reptile/Amphibian, and Beef Cattle. Dr. Frank pursued specialty certification to focus on her professional development and to improve her diagnostic skills and knowledge of advanced treatment techniques. Achieving certification continues a lifelong dedication and commitment to advancing skills beyond a postgraduate degree as a Doctor of Veterinary Medicine. In 1992, Dr. Frank graduated from Colorado State University’s College of Veterinary Medicine, and in 1995 opened North Central Animal Hospital, PC in Phoenix, AZ. The facility has advanced surgical and diagnostic equipment to provide a very high level of care. 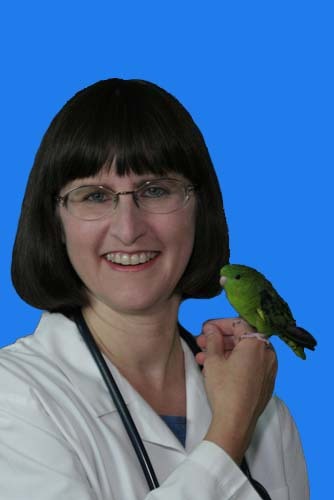 In addition to providing health care for birds, she treats dogs, cats, rabbits, rodents, ferrets, and reptiles. Dr. Frank also provides licensed avian wildlife rehabilitation organizations diagnostic testing, treatment, and surgery on native and migratory birds at no charge. She is active in the community and a member of numerous veterinary and civic organizations. Currently there are only 150 veterinarians certified in avian practice worldwide. Dr. Frank was the first Avian Specialist in Arizona, and one of only two veterinary bird specialists in private practice statewide. For more information on species specialty certification through ABVP, or to find a species specialist in your area, visit www.abvp.com. Read an article on Pet Bird Care.